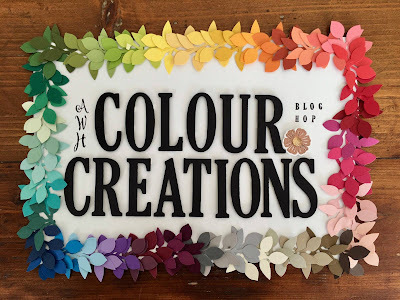 Well here we are again with another beautiful colour. Lovely Lipstick is such a rich Pink colour I wouldn't mind having a lipstick that colour. Today I have kept it fairly simple with no sentiment on the outside, only the floral image and some red rhinestones. 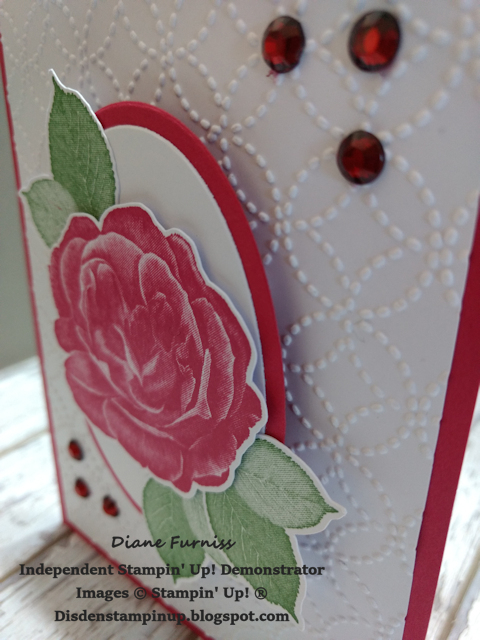 I started out with my main card being Lovely Lipstick and layered with a Whisper White that I run through my Big Shot using the Quilt Top Embossing folder. Then I took 2 layering ovals and cut them out one in each of the 2 colours mentioned above and glues them together before adding Dimensionals and placing this on the centre of the front of the card. I stamped my image from the Healing Hugs stamp set and 3 sets of leaves before fussy cutting them out and added to the ovals on the front of the card. I did this using more Dimensionals for the rose and them gluing the leave into place after so the I could put them just were I wanted them. 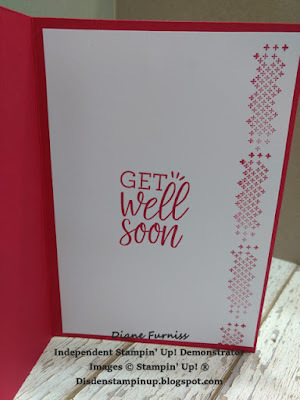 I then added 3 Red Rhinestone at the top on the right-hand side and another 3 at the bottom on the left-hand side just to finish off the front of the card. 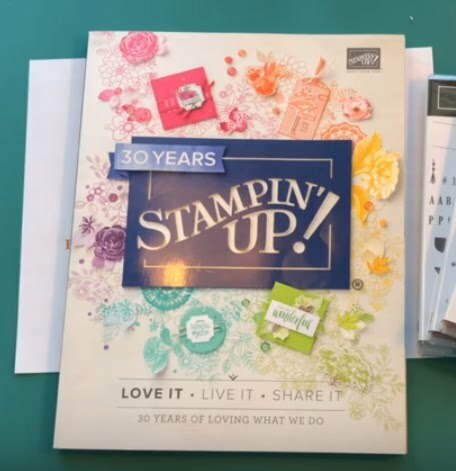 I added a Whisper White insert to the card and stamped in Lovely Lipstick using the crosses stamp from the same stamp set and also the sentiment. I don't think the front of the card really needs a sentiment as the work on the inside say it all. Everything used in this project can be found in the 2018-2019 Annual Catalogue, if you would like to purchase any or all of these items please give me a call or email so that I might help you with your purchase. Thank you. Have a great week see you all soon. Diane I love the white space on this stunning card and I agree it doesn't need a sentiment on the front. Thanks so much for hopping along tonight. 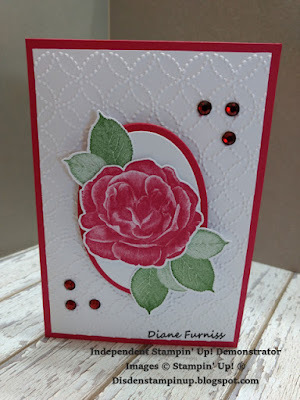 Gorgeous card, Diane, I love how you have placed and layered the bloom in the ovals! Such an elegant card Diane. A classic case of 'less is more'. Beautiful! The oval really frames the image. The rose looks great in Lovely Lipstick! 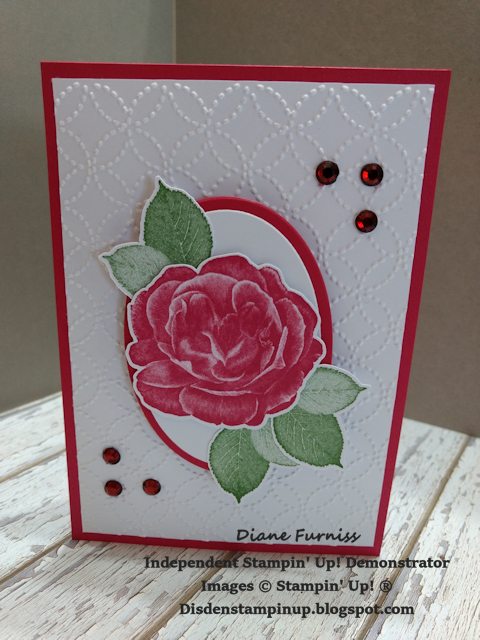 Diane, this is such a lovely card I just love the rose and how you have left it without the sentiment on the front so that it is completely the focal point!